(2019-04-11) The Annual General Meeting of the Kensington North Watersheds Assoc. will be held at 7:00 pm on Wednesday, April 24th at the Murray Christian Centre, 17 School Street, Kensington. Guest Speaker for the evening will be former CBC reporter Ian Petrie. Mr. Petrie has had a long involvement in resource issues and will bring unique and well informed remarks from his perspective of watershed activity on PEI. (2019-04-02) Presentations by guest speakers and Kensington North staff covered a wide variety of topics at the farmers meeting held in Kensington last week. Forestry Initiatives, Hazardous Waste, Living Labs, Nitrogen Considerations, Precision Agriculture, Soil Compaction and Subsoiling were discussed. Click here for more information on the different and access to the presentations. 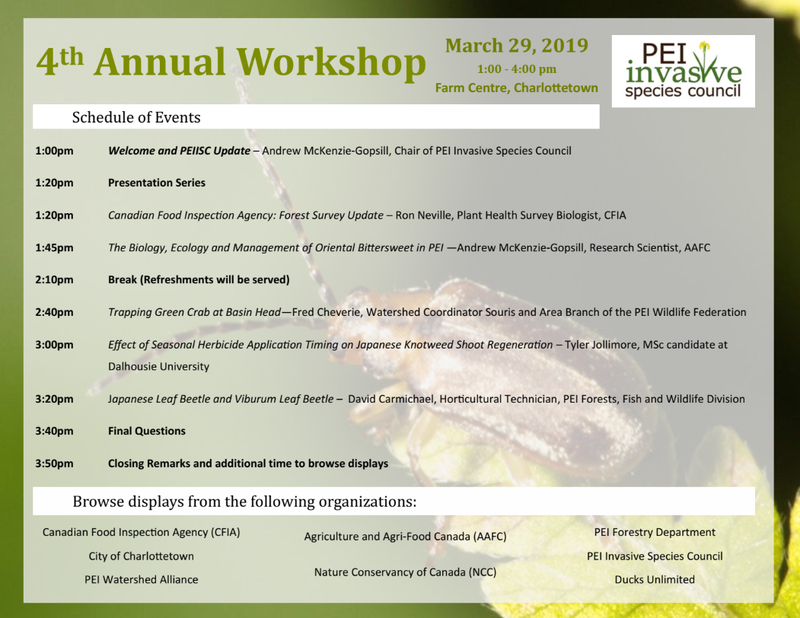 (2019-03-22) The fourth Annual Workshop presented by the PEI Invasive Species Council will be held at the Farm Centre, 420 University Ave, Charlottetown on Friday, Mar. 29th from 1:00 - 4:00 pm. Click here to download a PDF version of the poster. (2019-03-20) The Annual Farmers Meeting hosted by Kensington North Watersheds Association will be held at 1:30 pm on Tuesday, March 26th at the PEI Agricultural Insurance Corporation Boardroom, 7 Gerald McCarville Dr. in Kensington. Guest speakers include: Vernon Rodd, Soil Specialist, Agriculture & Agri-Food Canada; Evan MacDonald, Soil & Water Conservation Specialist, PEI Agriculture & Fisheries; Kyra Stiles, Agri-Environmental Development Coordinator, PEI Agriculture & Fisheries. Topics will include: Soil Compaction, New Applications for GPS, 4R Nutrient Management Trials, 2019 Field Trials. What are the Effects of Household Hazardous Wastes? (2019-03-20) There are a variety of effects and they vary based on the product. From a watershed perspective, our concern is around water quality and safety. 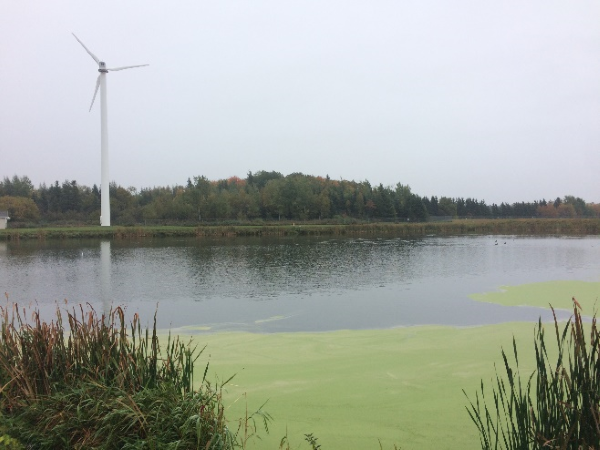 It may seem as though improper disposal of something like old paint couldn't possibly have effects on our water here on PEI, but our water cycle is surprisingly intertwined with disposal! Almost Products flushed down the toilet or poured down the drain will either travel to a wastewater treatment facility, like we have in Kensington, or to your septic system if you live outside of town. There are lots of complicated processes going on in these systems to break down our organic waste and treat the water before its released back into our environment; however, these systems are not designed to treat hazardous wastes, and harmful ingredients could be passing through, back into our ground and surface water untreated. So, what about throwing out hazardous wastes in your black cart? Well, that can be linked to our water cycle too! PEI's landfill is designed to catch water given off from our garbage, called leachate, and treat it onsite before it is released back into the surrounding environment. However, this system isn't designed for treating hazardous materials either. Click here to view the full article published in The County Line Courier. Please see our news archive section in the margin for older Association news.